Interstate 90 (I-90) is an east–west transcontinental freeway, and the longest Interstate Highway in the United States at 3,020.54 miles (4,861.09 km). Its western terminus is in Seattle, at State Route 519 near T-Mobile Park and CenturyLink Field, and its eastern terminus is in Boston, at Route 1A near Logan International Airport. The western portion of I-90 crosses the Continental Divide over Homestake Pass just east of Butte, Montana, connecting major cities such as Spokane, Washington; Billings, Montana; Sioux Falls, South Dakota; and Madison, Wisconsin. Between Seattle and the Wisconsin-Illinois state line, I-90 is a toll-free Interstate. East of that border, much of I-90 follows several toll roads, many of which predate the Interstate Highway system. These include the Jane Addams Memorial Tollway, Chicago Skyway, Indiana Toll Road, Ohio Turnpike, New York State Thruway, and the Massachusetts Turnpike. The Interstate is not tolled through some segments in downtown Chicago; Greater Cleveland and the rest of Northeast Ohio; Erie and the rest of Northwestern Pennsylvania; and through brief sections near Buffalo and Albany. The western I-90 terminus is in the SoDo neighborhood of Seattle. I-90 eastbound begins at exit 2B, Edgar Martínez Drive S (State Route 519) and 4th Avenue S. I-90 westbound exit 2B ends at Edgar Martínez Dr and 4th Ave near T-Mobile Park, as well as 4th Ave just north of S. Royal Brougham Way near CenturyLink Field, about a block east of the entrance to the Port of Seattle's container shipping terminal at Pier 46. The tunnel that carries I-90 under the Mount Baker Ridge is on the National Register of Historic Places. The east portal of the tunnel (visible when entering Seattle from the east) is constructed as a bas relief concrete sculpture. I-90 incorporates two of the longest floating bridges in the world, the Lacey V. Murrow Memorial Bridge and the Homer M. Hadley Memorial Bridge, which cross Lake Washington from Seattle to Mercer Island. They are the second and fifth longest such bridges, respectively. Forty miles (64 km) east of Bellevue, I-90 traverses the Cascade Range's Snoqualmie Pass, elevation 3,022 feet (921 m). It intersects I-82 shortly after exiting the mountains and crosses the Columbia River on the Vantage Bridge at mile post 137. After entering Spokane near mile post 279, it enters Idaho eighteen miles (29 km) later. Since 1980, I-90 from Seattle to Thorp was designated the Mountains to Sound Greenway to protect its outstanding scenic and cultural resources. The small town of Wallace still prides itself on having what was the last stop light in the Rocky Mountains on I-90. Its downtown has many historical buildings, which would have been wiped out by the original planned route of the freeway, so in 1976, city leaders had the downtown placed on the National Register of Historic Places. As a result, the federal government was forced, at great expense, to reroute the freeway to the northern edge of downtown and elevate it. That section of I-90 opened in September 1991. A bicycle path is routed beneath part of that segment. In the period between 1995 and 1999, there was no numbered speed limit on I-90 in Montana. The speed limit was simply defined as "reasonable and prudent" as determined on a case-by-case basis by the Montana Highway Patrol. The speed limit in Montana is now 80 mph (130 km/h). From the west I-90 enters Montana on the summit of Lookout Pass. It passes next to Missoula and runs through Butte, where it connects with I-15 for close to eight miles (13 km), before crossing the continental divide just east of Butte where it goes over Homestake Pass, which is 6,329 feet (1,929 m) in elevation, the highest point for the Interstate. It passes between the Gallatin and Bridger mountain ranges over Bozeman Pass between Bozeman and Livingston. It follows the Yellowstone River from Livingston to Billings where it connects the suburbs of Laurel and Lockwood with the rest of the Billings area. In Lockwood it intersects with I-94's western terminus and turns south. South of Hardin it passes the site of the Battle of the Little Bighorn (Custer's Last Stand) at Crow Agency on the Crow Indian Reservation. Montana boasts the longest stretch of I-90, ranging just over 551 miles (887 km). I-90 enters the state of Wyoming from the north after splitting off from I-94 in Billings, Montana. The first major town is Sheridan where it heads southbound. It then follows the foothills of the Bighorn Mountains between Sheridan and Buffalo where it then intersects with I-25, where the route goes from a north–south orientation to an east–west orientation. It then goes across the Powder River Basin toward Gillette, Moorcroft, and Sundance where it shares alignments with both US 14 and US 16. Near the Black Hills, I-90 leaves Wyoming and enters South Dakota between Sundance and Spearfish, South Dakota where it proceeds southeast toward Rapid City, South Dakota. Near Rapid City at the Wyoming border I-90 is a four-lane divided highway with a grass median. In the Sioux Falls area, I-90 intersects I-29 and continues east a short distance to Minnesota. I-90 is the longest east–west thoroughfare in South Dakota. This interstate goes through Mitchell, Sioux Falls, and Rapid City. It does not go through the state capital of Pierre. I-90 crosses southern Minnesota from the South Dakota border near Beaver Creek, Minnesota, to the Mississippi River near La Crosse, Wisconsin. On most of its length in the state, it is close to the Iowa border and fairly parallel with it. In southeast Minnesota, it curves north to Rochester and Winona. 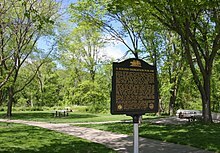 The wayside rest area near Blue Earth, Minnesota is where Minnesota's east-building and west-building I-90 teams linked up in 1978, thus completing the final mile of the Minnesota section and symbolically joining the 3,099.07 miles (4,987.47 km) of the Interstate. Since being overlaid with bituminous paving in 2006, the original four-foot-wide (1.2 m) gold colored cement concert line marking the completion of I-90 has been replaced with gold paint on just the shoulder portions of the roadway at the same location; plaques dedicating and describing this special segment of I-90 pavement can be found at the Blue Earth rest areas. At the Minnesota-Wisconsin border I-90 is carried on a high bridge over the upper Mississippi River, departing La Crescent, Minnesota. The route uses French Island for part of its ford over the Mississippi. Just upstream from the bridge is Lock and Dam No. 7. I-90 crosses Wisconsin from Minnesota to Illinois in a generally southeasterly direction. It joins I-94 in Tomah and I-39 in Portage. I-94 separates from I-90 at Madison. I-90 enters Illinois north of Rockford oriented north–south joined with I-39. It then runs east-southeast directly to the city of Chicago. From Rockford to I-294 the road is tolled and called the Jane Addams Memorial Tollway. Prior to 2007 the Jane Addams Memorial Tollway was called the Northwest Tollway. 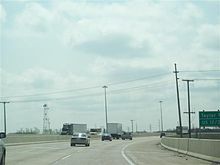 In the Chicago metropolitan area, I-90 is known by three names from O'Hare International Airport to the Indiana state line. The Kennedy Expressway runs from O'Hare to I-290 and the Chicago Loop. I-90 continues running south of the Loop on part of the Dan Ryan Expressway, and then southeast onto the tolled Chicago Skyway into Indiana. In the state of Indiana, the entirety of I-90 is concurrent with the Indiana Toll Road. I-90 enters from Illinois at the Chicago Skyway. It then runs to the concurrency of I-80/I-94 east of I-65, where I-80 leaves I-94 and joins with I-90. The combined I-80/I-90 route runs east across northern Indiana and near the southern border of Michigan to the Ohio state line. As part of the Toll Road, I-80/90 passes to the north of South Bend and Elkhart. It also passes north of Angola at I-69. The Indiana Toll Road turns into the Ohio Turnpike as it crosses the border. I-90 follows the Ohio Turnpike until just south of Lorain, west of Cleveland, where it turns north to follow a route near the shores of Lake Erie. Originally, it was going to be parallel to, and north of, I-80/Ohio Turnpike further west to Toledo. Parts were built with an interim assignment of State Route 2 (SR 2). Later; that plan was abandoned, and the I-90/I-80 exit/connector was built instead; those existing parts retain the SR 2 designation. In Cleveland, I-90 serves as the Innerbelt at the confluence of the northern termini of I-71 and I-77. One of the most peculiar and hazardous stretches of I-90 is the section of highway passing through downtown, known locally as Dead Man's Curve. Here, the road takes a nearly 90-degree turn. While there are plenty of large signs, flashing lights, and rumble strips alerting motorists to this turn, there have still been a large number of crashes resulting from inattentive motorists. There are plans to realign the freeway along a shallower curve within the next decade, as part of a larger project to improve the highway system in Cleveland. The Innerbelt in Cleveland previously used a steel-gusset bridge of the same design as the I-35W bridge that failed in Minneapolis, Minnesota in 2007. Beginning September 30, 2008, two lanes in each direction of the eight-lane bridge were closed to reduce the weight load on the structure. On October 8, 2008, the bridge was closed entirely to undergo a stress test. In May and June 2009, the bridge was closed while engineers lifted it with hydraulic jacks and moved it approximately six inches to realign it. Many in the Cleveland area had begun to question the safety of the bridge, and the Ohio Department of Transportation continued to stress that the bridge was safe and if there was any imminent danger it would be permanently closed. Construction of a new crossing, the George V. Voinovich Bridges, began in 2011. It includes two parallel bridges, one for each direction of traffic. The first bridge, carrying westbound traffic only, was built immediately north of the Innerbelt Bridge and opened in November 2013. Demolition on the Innerbelt Bridge, which closed November 23, 2013, began in January 2014. The project was finished in 2016 with the completion of the eastbound bridge, built on the site of the Innerbelt Bridge, and fully opened on October 24. From here I-90 again joins SR 2 and runs along the Lake Erie shoreline before heading through the industrial suburbs of Cleveland. As it nears the Lake County line, I-90 separates once again from SR 2 before briefly merging with I-271, which terminates at I-90. It then continues east through the rolling countryside to the Pennsylvania state line. In Pennsylvania, I-90 is called the "AMVETS Memorial Highway", is a non-tolled section that extends from the Ohio state line through to New York state going through Erie, Pennsylvania. It is also signed as such in New York. Although this was supposed to be the "Erie Extension" of the Pennsylvania Turnpike, it was actually completed in 1958 with funding from the Pennsylvania Turnpike Commission. When this portion of the highway was open, the speed limit was 50 mph (80 km/h). At 46.4 miles (74.7 km), it is I-90's shortest single-state length. I-90 becomes the New York State Thruway upon entering the state of New York. Between the Pennsylvania state line and the Syracuse interchange, it is also signed as the "AMVETS Memorial Highway". It follows the Lake Erie coast until Buffalo, where it joins the old Water Level Route until Albany. There, it takes a short detour along the Rensselaer County Veterans Memorial Highway before joining the New York State Thruway Berkshire Connector. Almost all of the New York portion of the road is a toll road, comprising the east–west portion of the New York State Thruway mainline and part of the Berkshire Connector, operated by the New York State Thruway Authority. It was originally constructed as part of the Thruway project in the middle 1950s and received its current designation as I-90 in 1958. The road roughly follows the course of the 19th-century Erie Canal for much of its length in New York State. "I-90" (operated by NYSDOT) carries I-90 between the two; however, the Berkshire Section directly connects to the mainline at Thruway interchange 21A 6.5 miles (10.5 km) west of the point where I-90 joins it at Thruway interchange B1. There once were two metric-only signs on the westbound New York State Thruway around Syracuse, which is about 100 miles (160 km) from Ontario. The NYS Thruway Authority decided to test metric signage, which may have briefly included an 88 km/h (55 mph) speed limit sign, on the Thruway. There was also a sign displaying the distance to the I-81 interchange in kilometers in Dewitt. These signs are now only displayed in mile figures. I-90 is currently the only Interstate having a complete set of nine spur routes (190, 290, 390...890, 990) within one state, in New York. I-80 in California has had all nine, but never all at the same time. In addition, I-990, a short spur route near Buffalo, New York not directly connected to I-90, is the highest number given to an Interstate. I-790 in Utica used to have a completely direct connection with I-90 at Thruway interchange 31. Various road redesign projects over the years have eventually led to this direct connection being partially severed. Traffic exiting the Thruway must use two different surface streets to reach I-790. However, it is still possible to travel from I-790 directly onto the Thruway. I-790 has some other oddities: no exit numbers, no reassurance markers, and it runs concurrent with New York State Route 5 (NY 5) for its entire length. The New York section of I-90 west of the Berkshire Section of the New York Thruway is defined as Interstate Route 504 in New York Highway Law § 340-a. I-90 in Massachusetts runs concurrently with the pre-Interstate-era Massachusetts Turnpike (known locally as "the Pike" or on signs as "MassPike"), which opened on May 15, 1957, from West Stockbridge at the New York state border to Route 128. The first section of the Boston Extension opened in September 1964 from the original Massachusetts Turnpike eastern terminus at Route 128 to the Allston/Brighton Tolls. The entire Boston Extension opened on February 18, 1965 continuing from the Allston/Brighton Tolls to I-93 in Downtown Boston. The new extension added 12 miles (19 km) to the MassPike's original 123. I-90 was extended again as part of the Big Dig from its terminus at I-93 to Boston's Logan International Airport and a terminus of Route 1A in January 2003 via tunnels under the Fort Point Channel and the Ted Williams Tunnel under Boston Harbor. This extended I-90 by an additional 2.3 miles (3.7 km), before finally terminating at Route 1A. Tractors with two 48-foot (15 m) trailers, called "turnpike doubles", are permitted to travel between exit 11 and through the New York state border. I-90 made heavy use of existing roads. The Massachusetts Turnpike, New York State Thruway, Ohio Turnpike, Indiana Toll Road, Chicago Skyway, and the Jane Addams Memorial Tollway all predate I-90 and were used for parts of its route. This also means that substantial portions of the route are not precisely to Interstate Highway standards, but they are usually close. The last section of I-90 to be built was between Seattle and Bellevue, Washington, which opened in stages between 1989 and 1993. I-90 used to have one of only a few snow sheds on the Interstate Highway System, at Snoqualmie Pass. The snowshed was used to cover the westbound lanes in the event of an avalanche, and had been removed at the end of April 2014. The Washington State Department of Transportation plans to replace the snowshed with avalanche bridges as part of a $551 million plan to widen I-90 along the east end of Snoqualmie Pass. I-90 in New York is the only interstate to have a complete set of auxiliary routes, all nine possible three-digit route numbers, within a single state. ^ a b Adderly, Kevin (June 28, 2017). "Table 1: Main Routes of the Dwight D. Eisenhower National System of Interstate and Defense Highways as of December 31, 2014". Route Log and Finder List. Federal Highway Administration. Retrieved October 12, 2017. ^ "Mountains To Sound Greenway (Washington)". ^ "RCW 47.17.140 State route No. 90: American Veterans Memorial Highway". Access Washington. State of Washington. Retrieved August 29, 2007. ^ "South Dakota Codified Laws". South Dakota Legislature, Legislative Research Council. Retrieved August 29, 2007. ^ Minnesota State Legislature (2006). "§ 161.12". Minnesota Statutes. Office of the Revisor of Statutes. Archived from the original on August 27, 2007. Retrieved August 29, 2007. ^ Roethele, Sue (October 1978). "Last Segment of I-90 Opens in Minnesota" (PDF). DOT Scene. Minnesota Department of Transportation. p. 15. Retrieved January 29, 2013. ^ "Construction Project Log Record" (PDF). Minnesota Department of Transportation. Archived from the original (PDF) on June 4, 2013. Retrieved January 29, 2013. ^ Google (August 29, 2007). "Satellite View of Cleveland, Ohio" (Map). Google Maps. Google. Retrieved August 29, 2007. ^ "Cleveland Urban Core Projects". Ohio Department of Transportation. Retrieved August 29, 2007. ^ Breckenridge, Tom (March 30, 2011). "Inner Belt Bridge Construction Begins as Massive Supports are Hammered into Bedrock". The Plain Dealer. Cleveland. Retrieved March 31, 2014. ^ Grant, Alison (January 13, 2014). "Old Inner Belt Bridge Steel Skeleton to Be Blown Up in Controlled Demolition". The Plain Dealer. Cleveland. Retrieved March 31, 2014. ^ Christ, Ginger (October 24, 2016). "Inner Belt Bridge is completely open today". The Plain Dealer. Cleveland. Retrieved October 24, 2016. ^ "Highways". Laws of New York. Retrieved August 29, 2007. ^ Cabrera, Luis (September 11, 1993). "Floating bridge finishes interstate". Detroit Free Press. Associated Press. p. 5A. Retrieved August 2, 2018 – via Newspapers.com. ^ "I-90 Snowshed Removal". Washington State Department of Transportation. Archived from the original on April 30, 2014. ^ "I-90 Snoqualmie Pass East". Washington State Department of Transportation. Wikimedia Commons has media related to Interstate 90.